Looking for a good long term self storage facilities requires a thorough evaluation and checking. Yes, there are things that you need to consider. Thorough evaluation helps you ensure that the facility you are about to rent is secured and at the same time also offers an affordable service. 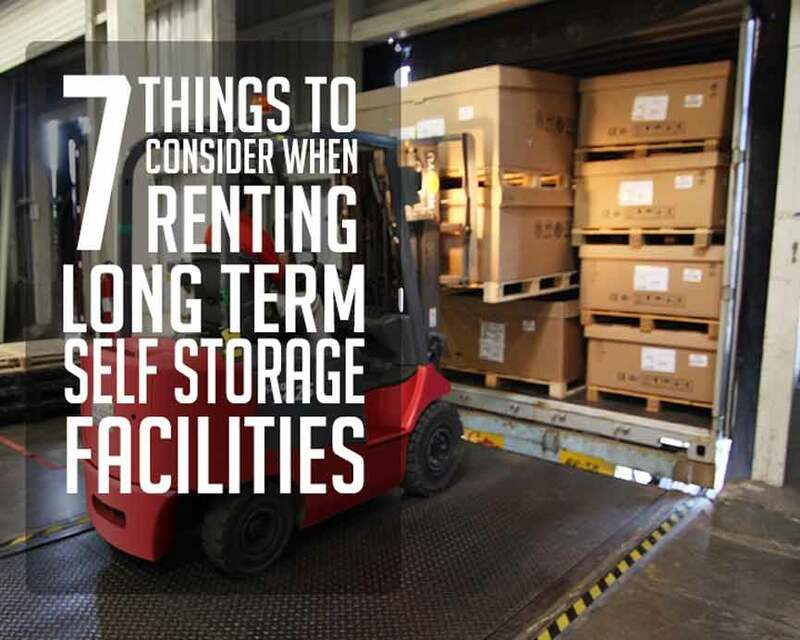 But before you start the deal with your chosen service provider, try to see if they meet the things you need to consider as you rent long term self storage facilities. Knowing the available storage size that the facilities have is very important. In fact, this will serve as your bases to determine if they can cater the capacity of your belonging. So, before you rent a self storage, check first the capacity of items you are about to store. Then refer to the available size of the units that the facilities have. Check if this capacity can be carried out by the selected storage facility you are about to rent. Doing this will help you minimise and avoid renting too much space. Always check if the facility has self storage insurance policy for your items. Review the things you are about to store. See if they have sufficient insurance cover if any worst case happens. Be practical and ask for their insurance policy. You should make things clear first before you consider renting them. The same thing when you plan to look for an office moving services, you need to check the insurance policy they have to secure your office move. And as you plan to rent for a long term self storage facilities, ask clarification about what items are allowed to be stored. Because believe it or not, there are things that you are not allowed to store as per law restrictions. This includes items like firearms, illegal goods, and etc. Renting a self storage unit is affordable. But you still don’t want to spend too much money on things that don’t benefit you. So, look for a facility that offers a wide range of optional services and flexible terms which also fits your need and requirements as you plan to store your belonging for a long period of time. Location is also one factor that you need to consider when selecting long term self storage facilities. Yes, a convenient location that offers 7 days a week access to your belongings is important to consider. For who knows you’ll be needing to restore some items from the storage unit. Consider also the security measures of the storage facility. This helps you guarantee that your belongings are safe and secure against any loss and damages. Hence, this will give you the peace of mind as you store your item for a long period of time. Most people use long term storage facility for a reason that they need to travel abroad in a long period of time. And if your one of them, then you need to consider the method of payments they have. Check if it is convenient for you. You can actually inquire to them directly and check if they have a secure automatic payment system where you can pay by credit card, direct debit or even PayPal for you to choose from. Whatever long term self storage facilities you need, always check the things you need to consider before you rent one. Also, don’t forget to ask for a self storage unit guide and be knowledgeable enough to know the things you need to know. Looking for a Reliable and Affordable Long Term Self Storage Facilities? Macy’s Mobile Self Storage is here to help as we have a variety of services offer that you can enjoy. If you want to know the best practices for long term self storage, you may read → Best Practice for Long Term Self Storage for more insights. This entry was posted in Storage and tagged long term self storage, Macy's Mobile Self Storage, self storage, self storage units.